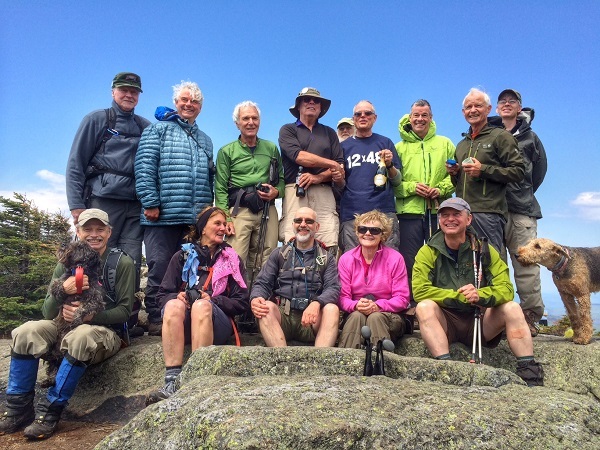 Per completed the Grid on May 24, 2015 on Mount Jackson. Front Row, Left to Right: John Sobetzer&Pepper, Nancy Foote, Gary Tompkins, Diane Schor, Steve Barbour, Cinnilla. Back Row, Left to Right: Bob Martin, Jeb Bradley, Bill Schor, Ed Hawkins, Charlie Foote, Per, Bill Cronin, Georg Feichtinger, Jim Towle Photo courtesy of Cory Ahonen.